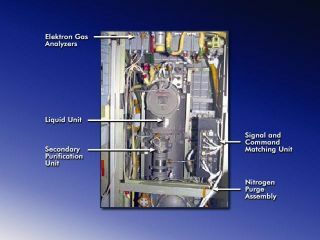 This diagram of the Elektron oxygen generator aboard the ISS is labeled to show major components, including the Liquid Unit, which Expedition 10 flight engineer Salizhan Sharipov refreshed with a new supply of electrolyte fluid using a spare Liquid Unit. This story was updated at 1:07 p.m. EDT. CAPE CANAVERAL, Fla.- A mild toxic leak and a smoke-like smell aboard the International SpaceStation (ISS) prompted an afternoon scare for three astronauts aboard theorbital laboratory, mission managers said Monday. The station's three-astronaut Expedition13 crew reported a smoke-like smell in the laboratory's Russian-builtZvezda service module and initially reported smoke itself, though the emergencywas later traced to a toxic irritant leak used in a primaryoxygen generator. "Everything is good, everything isfine," Expedition 13 commanderPavel Vinogradov told Russian ISS mission controllers in Moscow,adding that he had contained the apparent leak in a rubber bag. "There is no moredischarge, no more liquid." "The situation is stable right now,"Expedition 13 flight engineer JeffreyWilliams told Mission Control as he worked through the issue during thestation's afternoon shift. "There's an obvious smell. There was never anysmoke." In addition to Vinogradov - of Russia'sFederal Space Agency - and NASA's Williams, flight engineer ThomasReiter of the European Space Agency live aboard the ISS. The crew tracked the smell to a leakin the station's Russian-built Elektronoxygen generator, which separates water into hydrogen and oxygen throughelectrolysis, early Monday and shut down the unit at about 7:02 a.m. EDT (1102GMT), NASA officials said. It was later when Williams clarified his report,adding that no smoke was immediately apparent. "We have some sort of a leak, wedon't understand the source yet, but some sort of a leak of potassium hydroxide(KOH), that's coming out of the [oxygen] vent," NASA ISS program manager MichaelSuffredini said in a briefing, adding that the liquid is classified as a "Tox2" irritant aboard the station. "It's not a life-threatening material." But the crew's initial report ofsmoke prompted NASA and Russian ISS mission managers to declare a spacecraftemergency to gain access to communications satellites during the short-livedcrisis, Suffredini said, adding that all ventilation systems shut down aboardthe ISS to prevent the odor from spreading. At no point did NASA or Russian ISSmission controllers consider sending the Expedition 13 crew to their Soyuzlifeboat for either shelter or an emergency undocking, Suffredini said. NASA spokesperson John Ira Pettytold SPACE.com that the carbon dioxide levels inside the station'sRussian segment were low enough that the crew did not have to don theiremergency gas masks. But the astronauts did have to weargloves and surgical masks to avoid irritation from the potassium hydroxide,NASA officials said. The incident should not affect the Sept.20 docking of a new SoyuzTMA-9 spacecraft carrying the Expedition14 relief crew for Vinogradov and Williams, as well as payingISS visitor Anousheh Ansari. The trio launchedat 12:09 a.m. EDT (0409 GMT) Monday. "There's no reason right now that Iknow of that we would not have the crew come in and do the crew change-out,"Suffredini said. "In fact, with the extra crew there, it might be a good timeto do any troubleshooting and [replace and repair] work we think we need todo." NASA's space shuttle Atlantis and itssix-astronaut STS-115 crew undockedfrom the ISS Sunday after a week of spacewalks and orbital construction todeliver the $372million Port 3/Port 4 trusses and solararrays to the station. Space station crews have had difficultieswith the station's Elektron unit in the past, but the current unit hasexperienced none of those glitches, Suffredini said, adding that the ISS alsohas plenty of oxygen supplies aboard its current Progress22 supply ship and in storage tanks aboard the station itself. A spare Elektron unit is onboard, andwould require between one or two days to install if ISS managers decide it isnecessary. Another option is to repair parts of the Elektron system. "It's about the size of a waterheater," Suffredini said of the Elektron. ISS flight controllers told Williamsthat potassium hydroxide is typically odorless, and that the source of thealarming smell may be due to a rubber gasket that Vinogradov reported asdamaged by apparent overheating in the Elektron unit. "I believe that the rubber sealproduced that odor," Vinogradov said, adding that the Elektron appeared to stopleaking after he shut it off. While Williams reported no smoke in the space station's main cabin, that gasket itself was seen to be visibly smoking upon inspection, he toldNASA astronaut Shannon Lucid, serving as ISS spacecraft communicator at Johnson Space Center in Houston later. There were reports of the odor allthe way in the U.S.-builtDestiny laboratory on the opposite end of the ISS from the smell's sourcein the Zvezdamodule, Suffredini added. Russia'sZarya control module and the NASA's Unity node bridgeDestiny and Zvezda together. By 9:05 a.m. EDT (1505 GMT), thesmoke-like smell had dwindled and life aboard the ISS returned to near normaloperating conditions. It should take about 36 hours to completely swap andscrub the station's entire atmosphere, space station officials said. "The smell has gone," Williams told Lucid. "It has decreased significantly." Vinogradov reported a series of upto five drops leaked out of the Elektron before it was shut down, followed bylarge, three-centimeter globules, all of which he contained in a rubber bag.The liquid was clear, "like water," Vinogradov said. The liquid will be discarded inOctober aboard the Progress 22. An earlier supply ship, Progress21, will be jettisoned from its berth at the aft end of the station'sZvezda module later today and has already been sealed for undocking, Suffredinisaid. In 2002, ISS astronauts were confined tothe Russian segment of the station due to a glitch with the outpost'sU.S.-built Quest airlock. The odor prompted headaches in the station's threeExpedition Four astronauts. Higher than normal concentrations ofcarbon dioxide in the station's Zarya control module mayalso have contributedto some ill effects reported by NASA's STS-96 astronaut crew in 1999. ISS astronauts are trained torespond to several types of emergency - both before flight and while in orbit -including smoke and fires, toxic leaks and rapid decompression, Suffredinisaid. Aboard the ISS, station crews hold a monthly fire drill, he added. Williams later asked flightcontrollers to contact the Expedition 13 crew's families to let them know whathad occurred. "Jeff, we're already working on thatand we're calling Anna-Marie," Lucid told him,referring to Williams' wife.